The Wannsee Conference research papers discuss the meeting of senior Nazi officials that was held in the Berlin suburb of Wannsee on 20 January 1942. 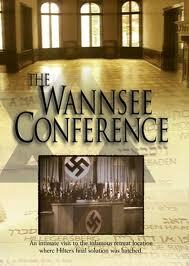 Essays and research papers on the Wannsee Conference can be custom written for any world history topic you are assigned. The purpose of the Conference, organized by SS head Reinhard Heydrich, was the coordination of the various government agencies in implementing the Final Solution, the extermination of Jews. It was at the Wannsee Conference that Heydrich outlined how European Jews would be rounded up and sent to the various extermination camps. On 31 July 1941, Herman Göring asked Heydrich to prepare a plan to deal with Jews in areas occupied by Nazi Germany. Heydrich sent out invitations to the Conference in November 1941. However, the meeting, originally scheduled for 9 December was postponed by the Soviet counter offensive and the Japanese attack on Pearl Harbor, which caused Nazi Germany to declare war on the United States. The Wannsee Conference lasted about 90 minutes, the first hour of which was taken up by Heydrich’s talk, followed by question and answer. It was only in retrospect that historians understood its importance to history, in marking a turning point in the prosecution of the Holocaust. However, copies of the minutes, known as the Wannsee Protocol, were burned by the various participants at the end of the war. The Nuremburg Tribunal was able to obtain a copy, which aided in the prosecution of Nazi war criminals. WWII - A research paper on WWII explores the impact World War II had on the international scene. America in World War II - Research papers explore American involvement in the Second World War. World War II - World War II research papers can be on any history topic about WWII. Schindler's List - Two of the best Holocaust films, in the opinion of this reviewer, are Steven Spielberg's Schindler's List and Heinz Schirk's The Wannsee Conference. Auschwitz - Jewish confusion about the Reich's ultimate goal for them can be perfectly understood, given that until the Wannsee conference of 1941 and its relation to Auschwitz. Nazi Germany's Negative Antisemitism Propaganda - How influential was the Nazi Germany's Negative Anti-Semitism Propaganda towards the Jewish people before and during the Holocaust. German Public Knowledge of Concentration Camps - This question has enjoyed a strange duality in that most 'ordinary' German citizens of the era claim to have known little or nothing about the holocaust. Nazi Medical Experiments - Nazi Medical Experiments research papers look at the experimental medical procedures done to Jew, Gypsies, and handicapped people that were in Nazi Camps. Third Reich - The Nuremburg Laws of 1935 stripped all Jewish people of their rights, beginning the descent into the Holocaust. Hitler's Willing Executioners - The fanatical Nazis and the impressionable youth that make up the Hollywood view of the Holocaust is an inaccurate picture of the reality of concentration camps. Nazi Euthanasia Program - Nazi Euthanasia Program is an example of discrimination and racism as social policy and was instrumental in carrying out Adolf Hitler's plan. Nazi Government - Nazi Government research papers show you how to write about the Great Slump and how German Citizens reacted to the Nazi Government's political power. Paper Masters writes custom research papers on The Wannsee Conference and discuss the meeting of senior Nazi officials that was held in the Berlin suburb of Wannsee on 20 January 1942.